Today I heard about a new service called Send My Chips which helps player move funds between different poker sites. Send My Chips takes a fee for the service. This is a good feature if you play at many poker sites since you can move money between them. I think the transfer between the poker sites needs to be almost instant to be successful. 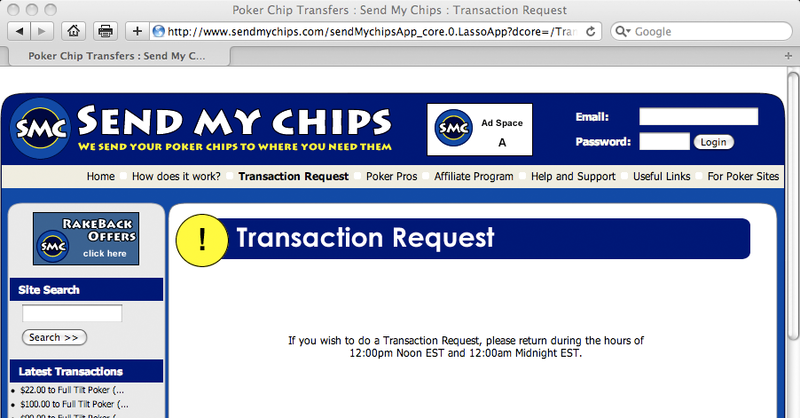 I got really curious about the service but when I went to their website and tried to make a transfer between two of the poker sites that has joined Send My Chips I got a message saying “If you wish to do a Transaction Request, please return during the hours of 12:00 Noon EST and 12:00am Midnight EST“. Why aren’t they offering a 24/7 service? This makes the service not open to a lot of players! I don’t really understand the reason for it. Send My Chips have probably done some research pointing to that those hours are when players are playing the most, but you shouldn’t forget about the rest! And I know that Send My Chips in the end will loose more than they save by not offering a 24/7 service. I’ve tried it out now and I am one lost customer! I’m really looking forward to the day when you are able to play on most sites with the same account. The player experience will be so much better when you only have one username to remember and one wallet of money!